Visier introduces Visier Talent Advisor, putting real-time Big Data analytics into the hands of every HR and people manager. With Visier Talent Advisor we are putting immediate, fact-based answers in the hands of HR and people managers. Visier, the innovation leader in Workforce Intelligence, today unveiled Visier™ Talent Advisor, a market-changing new capability that solves the challenge every manager faces in making the right decisions about their talent, providing instant access to relevant, comparative data for meaningful cohort analysis. -A team member has been offered a higher paying position at another company -- should I counteroffer? What should I counteroffer? -I have a new leadership position opening -- who is my best internal candidate? -An employee has asked for a promotion -- should I give one? As outlined in this Harvard Business Review article, even good managers make poor decisions. To learn how to help managers make effective decisions using a data-driven approach, read: Counter-Offers: Know When to Hold’em or Fold’em. To understand the science behind faulty decision making, and get tips for adopting a more analytical approach to talent decisions, read the blog post: Why Experienced Managers Make Bad Talent Decisions. Why do managers make people decisions based on intuition instead of fact? While organizations collect more employee data than ever before, this data is locked in HR management systems that were never designed for analysis. These systems were created to support business processes, such as allowing managers to approve time off, request a new position, or provide performance feedback. Yet business processes are what happens after the people decisions have already been made. Meaningful analysis of employees must be on demand, comparative, and reflect that employees develop and change over time. Meanwhile, “back office” analysis typically takes too long or is based on out-of-date data, and requires data science expertise even large companies often do not have. Why is Visier Talent Advisor unique? Part of Visier’s Applied Big Data solution for Workforce Analytics, Visier Talent Advisor is designed to guide any HR or people manager to the best decision, regardless of his or her data savvy or analytical acumen. 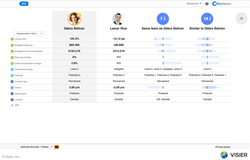 With Visier, HR can calibrate people decisions, and people managers can gain meaningful insights into specific employees via relevant, automated comparison cohort analysis. Because Visier connects all of an organization’s workforce data -- from all its disparate HR systems -- Visier can provide a more relevant analysis, taking into account hundreds of employee attributes, related to demographics, performance, compensation, learning and development, recognition, and more. To see a demonstration of Visier Talent Advisor, sign up for a demo session. Visier’s solutions let organizations understand and plan -- with precision -- how to best and most cost-effectively recruit, retain, and develop their workforce. With Visier, senior leaders, HR, and people managers alike can answer key workforce questions, align on goals and strategies, and act on decisions and plans to drive improved business outcomes. Visier does this by providing complete pre-built solutions in the cloud as a service that leverage Visier’s innovative multi-dimensional, in memory technology to provide capabilities otherwise not possible. Founded by business intelligence experts—including former Business Objects chief executive officer, John Schwarz—the company's leadership team has a proven track record of technical, operational, and strategic management success with companies such as IBM, SAP, and Oracle. With millions of customer employee records in the cloud, Visier is experiencing significant growth.